Our Transportation Department places a top priority on the safety of each student in our school. We support all school transportation needs such as busing students to and from school each day, providing special needs transportation, accommodating all extracurricular and activity trip busing needs, and providing vehicles for employees to attend workshops and conferences. Our school bus drivers possess a Commercial Driver’s License and pass the state bus driver certification. We’re proud of our safety record and the years of service it has provided the Pomerene School. Riding the school bus is a privilege, not a right. We enforce bus rules to make travel to and from school as safe as possible. Please be aware that we monitor video and audio on all Pomerene School buses to ensure our drivers and students abide by these rules. No eating, drinking, or chewing gum while on the bus. Keep voices at a low level. We do not allow students to throw items out the window or on the bus. No destruction or defacing of school property. 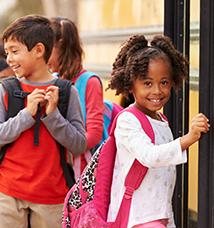 Students must prearrange authorization through the principal’s office before transporting an animal on a school bus. Students must bottle or cage all live animals. We prohibit all games and dangerous activities. No shoving or pushing while on the bus or while standing in line waiting to get on or off the bus. No fighting while on the bus or while standing in line waiting to get on or off the bus. Never stick hands, arms, or any other part of the body out of windows or doors. If, for some reason, you must cross the street, cross in front of the bus, and look in both directions before stepping out from in front of the bus.